Niagara Falls is an amazing site by day or night. The "American Falls" is on the left (in Buffalo, NY), and the "Horseshoe Falls" is in the middle (on the border between the US and Canada). There are a lot of fancy hotels on the Canadian side, along with various entertainment venues. The small boat is the Maid of the Mist--one of a fleet of vessels which have been taking tourists (including us!) right into the thundering spray of the falls since the 1800s. 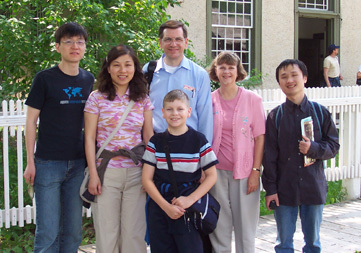 Another highlight of this trip was a visit with some of our best friends from Shanghai (now residents of Toronto, Canada).  They said life in Canada has not been easy, and they especially miss their family and friends. We know what THAT feels like, so it was great to be together again! 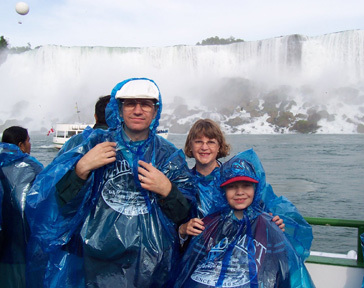 Michael, Vivian and Andrew (along with Michael's parents) ride the world-famous Maid of the Mist at Niagara Falls. 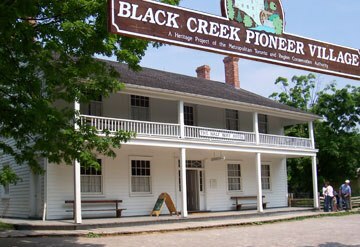 The two photos above and the one of the mill below were taken as we enjoyed Toronto's Black Creek Pioneer Village, an outdoor museum where you can step back into the pioneering days of the 1800s. 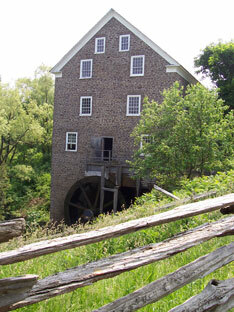 Many of the historic buildings have crafts-people at work who are glad to answer your questions. 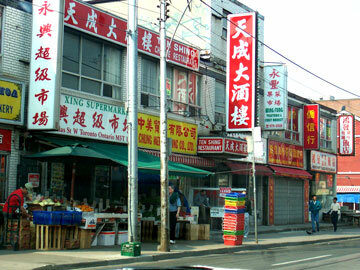 Toronto is a huge, clean, beautiful city with a rich mixture of ethnic communities, including a large Chinese population. 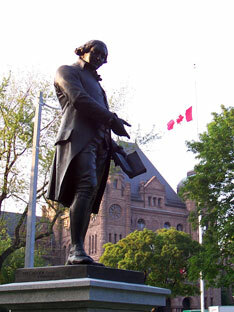 (Left) A working mill at Black Creek Pioneer Village; (Center) a 1930s monument in front of the provincial capital (the man founded Canada's Sunday Schools to help children learn the Bible); (Right) a picturesque view of a church with the CN Tower looming behind it and a theater to the right. At the time we visited, the CN Tower was the world's largest structure (I think it has lost that title now). 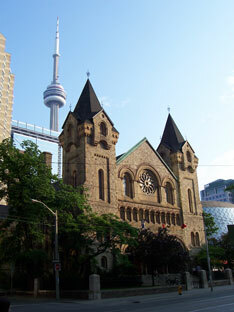 Towering over the city of Toronto, it offers a magnificent view of the city and Lake Ontario.